Krill oil is a type of fish oil supplement that provides essential fatty acids, while vitamin D is a fat-soluble vitamin that’s essential to proper calcium absorption. Depending on your diet and health status, you benefit from taking krill oil or vitamin D, or perhaps both. Before you begin taking either supplement, consult your doctor about the potential risks, interactions and side effects, as well as the correct dosages. Both krill oil and vitamin D are derived from fatty fish. Vitamin D is in cod liver oil, eggs, fortified cereals and milk, tuna, mackerel, sardines and herring, according to the University of Maryland Medical Center. Your body also makes vitamin D from sun exposure to your skin. 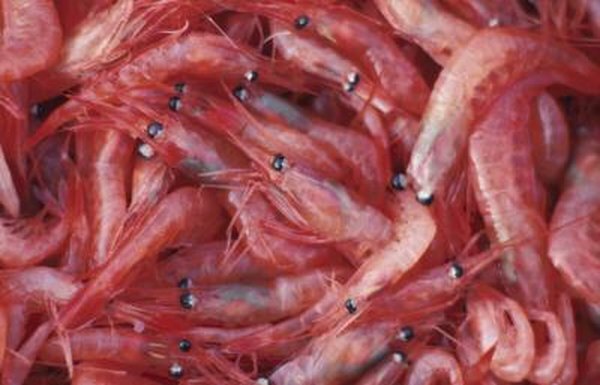 Krill oil is made from the shrimp-like crustaceans that live in the Antarctic Ocean. Krill oil is often used as an alternative to fish oil supplements. Krill oil contains omega-3 fatty acids, specifically docosahexaenoic acid, or DHA, and eicosapentaenoic acid, or EPA. The omega-3s in krill oil give the supplement anti-inflammatory and cholesterol-lowering activity. Krill oil also contains phospholipids, omega-6 fatty acids and a carotenoid known as astaxathin, which provides antioxidant effects. Vitamin D is a fat-soluble vitamin that’s essential for retaining proper phosphorous and calcium levels in your body. It also may help prevent cancer and support the cells of your kidneys, stomach, intestines, prostate and brain. Krill oil is primarily used to treat premenstrual syndrome, menstrual cramps and high cholesterol, according to the University of Pittsburgh Medical Center. It might also help treat rheumatoid arthritis and osteoarthritis. Vitamin D is mainly used to treat osteoporosis. You might take vitamin D supplements to help treat psoriasis, scleroderma and seasonal affective disorder. Vitamin D could help prevent bone disorders like osteomalacia and rickets and reduce the risks for high blood pressure, diabetes, heart disease, multiple sclerosis, obesity and certain types of cancer, according to the University of Maryland Medical Center. Because krill oil contains essential fatty acids and vitamin D is fat-soluble, krill oil may increase your absorption of vitamin D. Krill also contains certain amounts of vitamin D itself, notes the Memorial Sloan-Kettering Cancer Center. For some people with absorption problems, this effect could be beneficial, but for other people, this could cause excessive vitamin D. Too much vitamin D can lead to fatigue, weight loss, poor appetite, vomiting, diarrhea, constipation, bone pain, itchiness, frequent urination, thirst and muscle problems, according to the University of Maryland Medical Center. Because vitamin D increases your absorption of calcium and is often taken along with a calcium supplement, use caution if you have heart or kidney problems. In addition to krill oil, other supplements and medications can increase your blood levels of vitamin D, posing a risk of overdose. These include hormone replacement therapy using estrogen, the diuretic thiazide and the tuberculosis drug called isoniazid. Krill oil can cause side effects like gastrointestinal distress and rare allergic reactions. If you have a bleeding disorder or take blood-thinning medications, taking fish oil could increase your bleeding risks, as well.